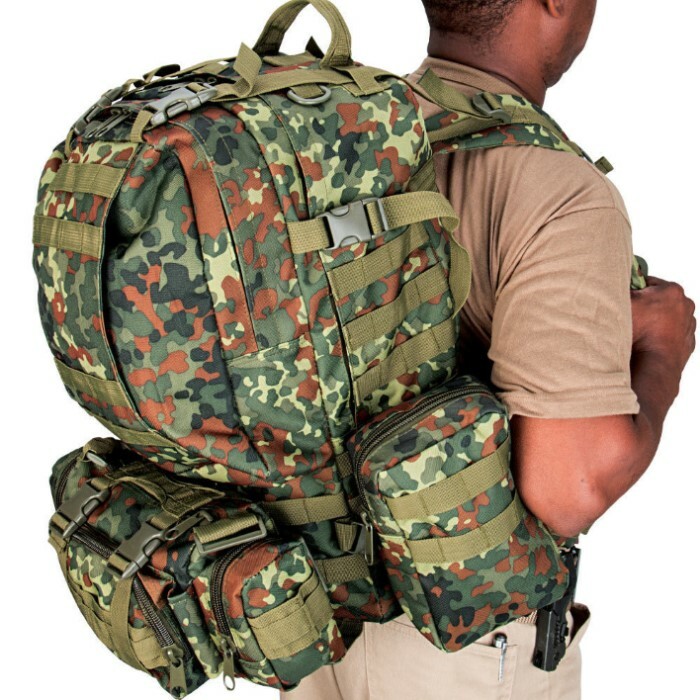 M48 Ops Gear Backpack German Flecktarn Camo | BUDK.com - Knives & Swords At The Lowest Prices! Approx. 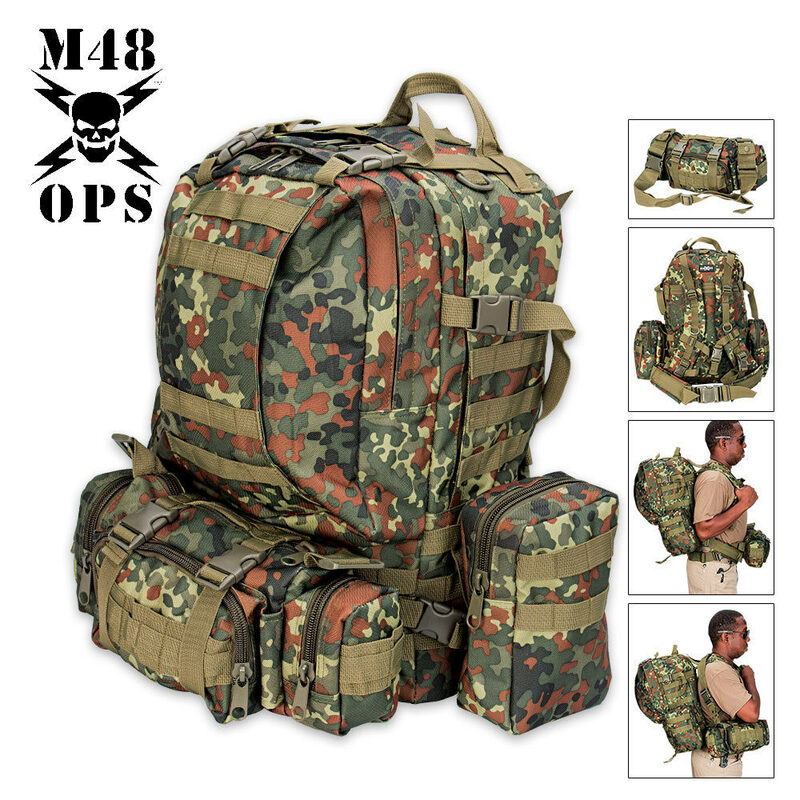 21" x 12" x 6"
This new backpack by M48 Ops will easily house all your field and tactical gear, featuring an extra-large main compartment and large secondary compartment, both of which feature a multitude of pockets for organization. This backpack also boasts two detachable side pouches and a large detachable front utility pouch. The utility pouch features a large main compartment and two separate smaller compartments on each side, tons of zippers, and straps for additional attachments. Ample MOLLE webbing throughout the backpack's design, including on the detachable pouches, allows you to attach all your additional gear quickly and easily. D-Rings and built-in carabiners also make for easy attachments. The back panel and shoulder straps are padded for comfort during long treks, and the adjustable waist strap and shoulder straps allow you to achieve a custom, comfortable fit. A sturdy emergency drag handle is also incorporated into the top of this backpack. 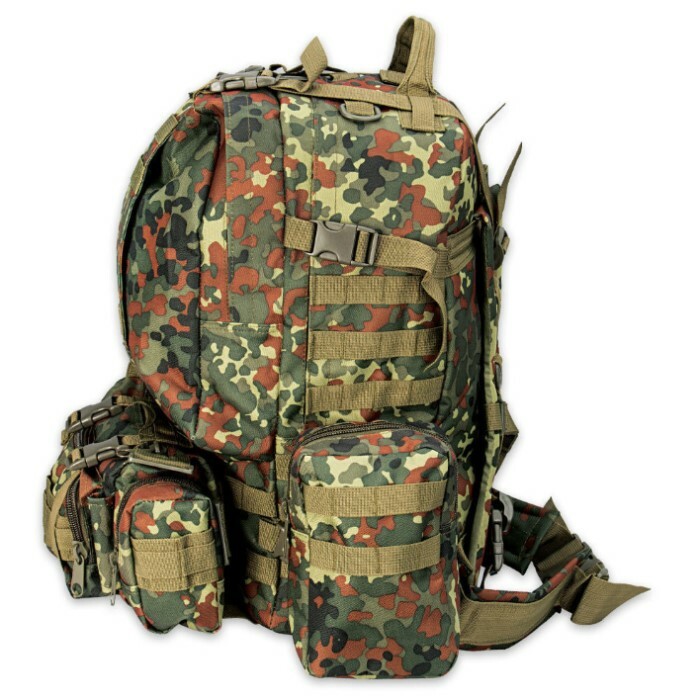 Multiple straps, buckles, zippers, pockets and attachment points allow you to carry tons of gear with this M48 Ops backpack efficiently. I was very excited when I saw the package on my front porch. As I opened it my excitement dimmed. Don't get me wrong. It's a decent bag. But the description makes it seem a lot better than it really is. The main compartment is fairly large but the secondary compartment is not that big. The multitude of pockets for organization they claims are in these two compartments are in fact not there at all. It is simply a piece of fabric that splits the compartments in half. I was expecting a lot more. Also the padding this supposed to be on the back and the shoulder harnesses is very minute and would be very uncomfortable on a long trip loaded down. It does however have a ton of Molle webbing throughout the exterior. Overall it is a decent bag but it is not as depicted in the description and I really don't think it's worth $65. The German flecktarn pattern has so far been one of the best patterns for use in our area. To date, my gear has been short a decent patrol-pack in this pattern. This pack appears to fill that need - granted, it's no ALICE pack, but at first test-fitting, it certainly seems to hold promise. Another plus, it is the first mil-type pack that my wife can comfortably wear. I would LOVE to get ahold of the small duffle from this set as an individual item, if M48 ever offered that, so I could put it on my fleck plate-carrier in place of the OD Green one that is there now. I definitely see us getting more of this pack. My wife would like one in the Belgian woodland pattern, too.